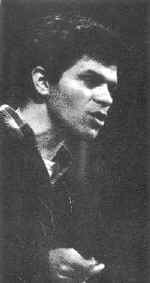 Gregory Corso (March 26, 1930 – January 17, 2001) was an American poet, the fourth member of the canon of Beat Generation writers (with Kerouac, Ginsberg, and Burroughs). Incarcerated in Dannemora for burglary in 1947, Gregory Corso dove into literature, and began writing poetry. He returned to New York City after his release in 1950 and met Allen Ginsberg in a bar in Greenwich Village (the Pony Stable). Ginsberg then introduced Corso and his poetry to other members of the beat literary scene. Gregory Corso’s first volume of poetry was privately published in 1955 (with the assistance of associates at Harvard, where he had been auditing classes): The Vestal Lady on Brattle and other poems. This was the year before the publication of Allen Ginsberg’s first collection of poetry, and two years before Kerouac’s On the Road. In 1958, Corso had an expanded collection of poems published as number 8 in the City Lights Pocket Poets series: Gasoline/Vestal Lady on Brattle. Herald of the Autochthonic Spirit (1981), and Mindfield (1991). His most notable poems are Bomb (formatted as typewriter-art in the shape of a mushroom cloud) and Marriage, a humorous meditation on the institution. Do you have any comments, criticism, paraphrasis or analysis of this poem that you feel would assist other visitors in understanding the meaning or the theme of this poem by Gregory Corso better? If accepted, your analysis will be added to this page of American Poems. Together we can build a wealth of information, but it will take some discipline and determination.